There are no Department Events scheduled at this time. There are no Department Press Releases at this time. There are no Department Wanted at this time. Neighborhood Watch is one of the oldest and most effective crime prevention programs in the country, bringing citizens together with law enforcement to deter crime and make our communities safer. 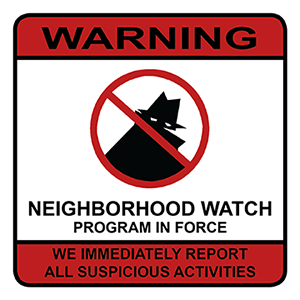 The idea behind a neighborhood watch is to educate private citizens on how to recognize and report suspicious activities while promoting better community relations. Neighborhood Watch members serve as extra eyes and ears for the police and channel information between neighbors and law enforcement officials in their combined efforts to prevent crime. Neighborhood Watch works because it reduces opportunities for crime to occur; it doesn’t rely on altering or changing the criminal’s behavior or motivation. Members of a neighborhood watch are not vigilante groups and should not assume the role of the police by taking the law into their own hands. A neighborhood watch is about neighbors being alert, observant and caring – and the most important task required of them is that they report suspicious activity or crimes immediately to the police. An active Neighborhood Watch brings safer streets and homes, community spirit, camaraderie with neighbors and stronger relationships with law enforcement. Neighborhood Watch can also help reduce drug dealing and open-air drug markets, discourage gangs, improve security of young people and help older neighbors stay safe from crime. The best deterrents to crime are observing and reporting suspicious activity. By getting involved and working with the police, you are effectively helping them help you.